Designing, constructing and installing custom stairs is a very detailed, thorough process. To ensure consistency and quality, we employ a turnkey approach to ensure flawless execution in every custom staircase project, no matter how unique the design. Whether we are working with an architect, general contractor, home builder, or homeowner, we ensure client satisfaction and top quality by following a proven, six-step process. From inspiration to installation, our team leverages expertise and capability to ensure client needs are met. In this two-part blog series, we will be walking you through the custom staircase design process. First, let’s consider the architectural plans for your residential or commercial space. Are you seeking elegant curved stairs, spiral stairs to maximize space in a tight area, or a straight staircase in a clean L-shape, scissor, or straight run configuration? Do you envision an open balcony or open handrail footage ascending the stairs? By starting with the architectural plans, we can design a custom staircase that fits the needs of the space. Next, consider the style of the space and inspiration for your custom stairs. 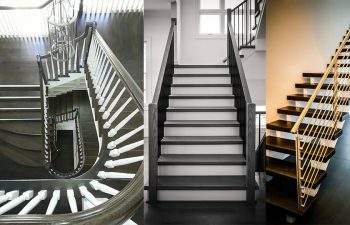 What style do you want your staircase to convey? A few styles to consider include: chic, whimsical, cutting-edge, traditional and farmhouse. In presenting to your client, ask the question: “Where can I go for inspiration?” Our product galleries, Houzz projects and Picasa Web Albums are all great places to start. Don’t find your ideal style in these places? Conduct internet searches for interior stair images that inspire you. In most cases, if you find it, we can make it! With limitless customization options, our innovative team will bring your vision to life, designing custom stairs with the style and components that inspire you. Now that your staircase inspiration and style have been identified, it’s time to work toward constructing the custom staircase! Stay tuned next week for Custom Stairs Design: Part 2, when we will discuss the steps our team takes to transform an idea into a beautiful and functional custom staircase. Visit our design tab and project galleries for additional details and pictures on our exquisite projects. From inspiration to installation our team is committed to designing and building the highest quality custom stairs. Our reputation speaks for itself and client satisfaction is our highest priority. Contact us today to discuss your next custom stairs project.